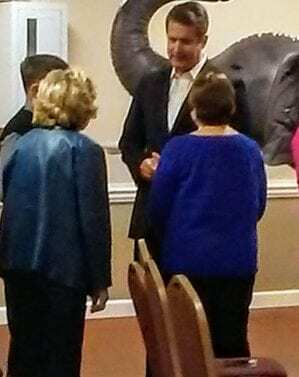 HIAWASSEE, Ga. – Towns County GOP welcomed state senator and gubernatorial candidate, Michael Williams, to their monthly meeting on the evening of Thursday, March, 15, 2018. Senator Williams took office in 2014 after winning the election with 66 percent of the vote against a long-time incumbent. Williams opened his address by recounting a number of hardships he encountered and overcame throughout his life, including the suicide of his Vietnam veteran father when Williams was 14 years old, literal and metaphorical hurdles he faced while competing on his school’s track team, and a trying battle against the Internal Revenue Service (IRS), which he won. The candidate for Georgia governor stated that he is the only contender who supported President Donald Trump during the election, claiming his opponents feared the donor base of the establishment. Williams avows to continuing fighting said establishment and says the self-funding of the majority of his campaign is just the beginning of his goals. Senator Williams said he plans to remove Georgia’s state income tax, promote term limits for all statewide offices, end common core in schools, oppose casinos in Georgia, and recover Georgia lottery funds for the Hope Scholarship. Michael Williams states he will outlaw sanctuary cities and begin deportations. Williams says he is the only candidate with a plan to identify and begin the deportation process through 287(g). The conservative candidate said he is adamantly pro-life and an advocate of religious freedom legislation. In addition, the senator affirmed he is a proponent of the second amendment and constitutional carry. When asked what sets the candidate for governor apart from the rest, Michael Williams said he is not funded by lobbyists, special interest groups, or corporations. “All of the other candidates, from Casey Cagle to Hunter Hill, get their money from those groups. I’m the only one that is self-funding, as well as relying upon hardworking Georgians, which allows me to stand up for the hardworking people of Georgia,” Williams stated. Towns County GOP meets on the third Thursday of each month at the Towns County Civic Center, adjacent to the Towns County Courthouse. A social gathering begins at 5:30 p.m. with the session taking place at 6 p.m. The Towns County Democratic Party has encountered difficulty arranging a date and location that meets the needs of its members. FetchYourNews is in contact with the Towns County Democratic Party Chair and plans to attend meetings once a schedule is established.